Willie Monroe Jr’s training camp for his September 16th World Title challenge against Billy Joe Saunders is well underway. 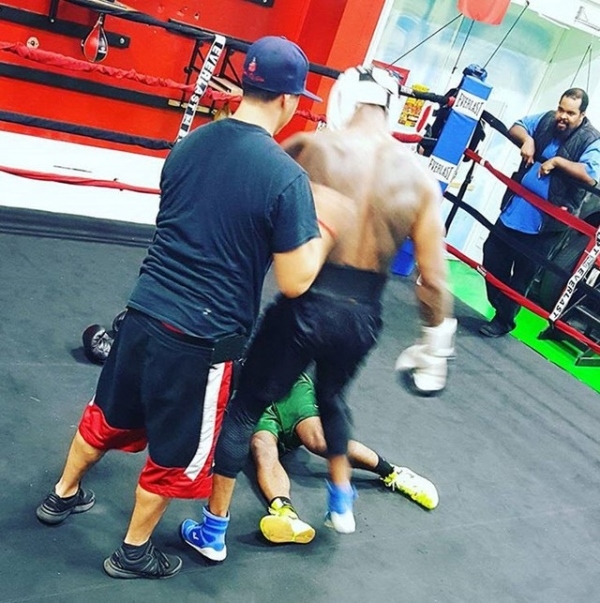 Yesterday, Monroe’s camp posted a photo showing the Middleweight contender standing over a reported Light-Heavyweight, who he’d knocked out during sparring. ‘El Mongoose’ also recently hosted a Facebook live Q&A session on his upcoming fight. When asked about whether Saunders trash talk had affected him the American was up front, “It’s definitely put some fire up under me. I think that’s a big mistake on his behalf. Last thing you want to do is make a nice guy mad. The former World Title challenger was also adamant that the WBO kingpin hadn’t faced an opponent like him before, “He’s never fought nobody like me. We can go down the list of everybody he’s fought. “I’m glad I’m the underdog too, I’m about to come up. I’m getting fired up now talking about it!”. Watch Billy Joe Saunders vs Willie Monroe Jr. September 16th at the Copper Box Arena, live on BoxNation alongside teen heavyweight sensation Daniel Dubois and Anthony Yarde as he hunts that world ranking.